It's Cherry season! If you haven't picked up some fresh cherries at the market I highly suggest you do so now. They are super fresh and at a good price this time of year. 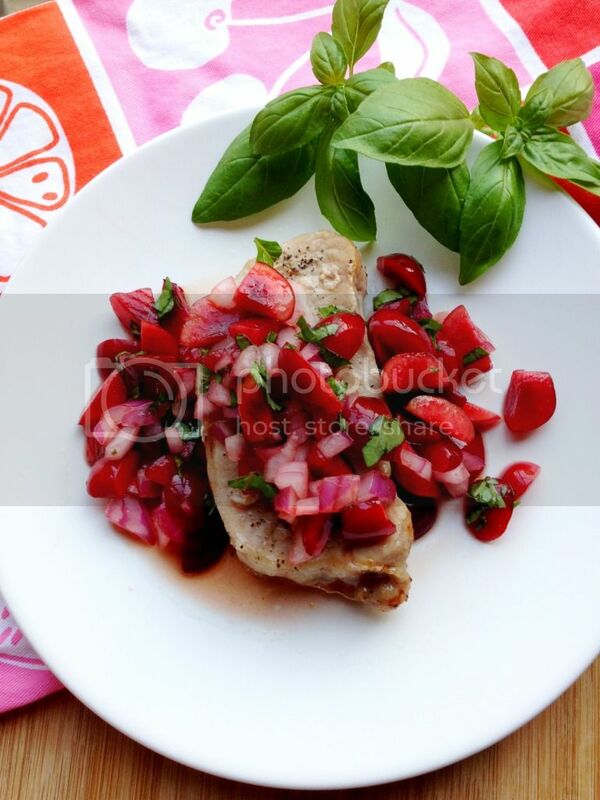 Then you can make Pork Chops with Cherry Salsa. The cherry salsa was super tasty. I wanted to just eat it right from the bowl with a spoon! I think you could do a lot with this cherry salsa, so even if you don't like pork, spoon it over chicken, or use on top of bread for a unique bruschetta. Or it might even be good on beef, the possibilities are endless! 1. Drizzle some EVOO and sprinkle some salt and pepper on both sides of the pork chops. Bake at 375 for 25 - 30 mins. 2. While the pork chops are baking, mix up your salsa. 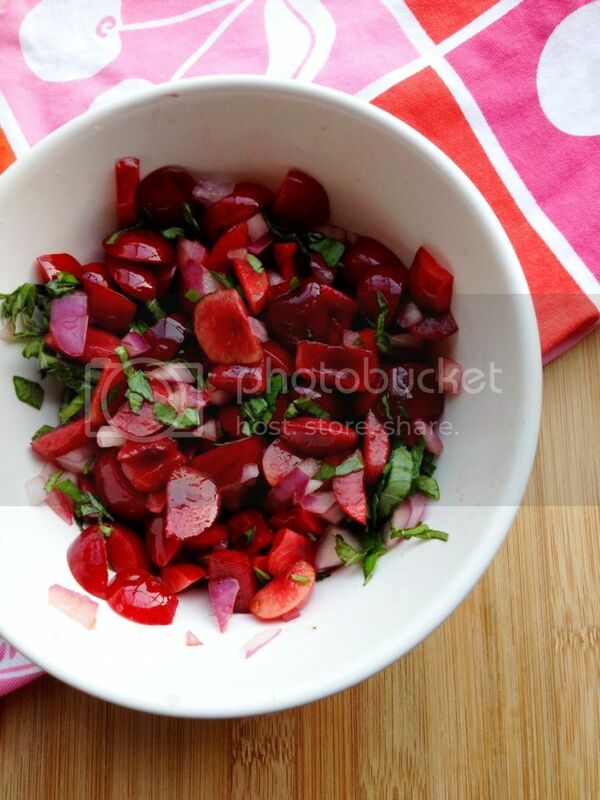 Combine cherries, red onion, lemon juice, basil, balsamic vinegar, honey, and salt in a bowl. Place into the refrigerator until ready. 3. Let the pork chops rest for 5 minutes before topping with fresh cherry salsa. I love cherries, but they are rather expensive her. Your goodies look so tasty. I love cherries too! Happy Pink Saturday. Looks sumptuous! Perfect for Pink Birthday celebration. Looks delicious! Happy Pink Saturday. What a variety of flavors to be mixed together. I imagine they taste really zesty and wonderful. Yet, it's hard to imagine at the same time. Thanks for sharing the recipe! I just might try it! Love your blog header photo!